Another check-out display item ensnared us on our last TJ's run. That clever Trader Joe. But you probably figured that out already just from the picture. You clever readers. It doesn't taste like a peanut butter and jelly sandwich, if that's what you're wondering. At least Sonia and I don't think so. We tasted chocolate first. Good chocolate. Milk chocolate. No surprises, no let-downs. Just chocolate. Then, after the chocolate, we tasted creamy peanut butter. Peanut butter and chocolate = win. It's difficult to screw it up. And everybody knows what a Reese's tastes like. So it's really that third and final element that's the wild card: the jelly. Most of the time, when I make a PB & J sandwich, I use grape jelly. I think it tastes best. Sometimes I'll wind up with strawberry, which also works. But I can probably count on one hand the number of times in my life I've made a PB & J with raspberry jelly. Not that it would be terrible. It's just that we don't usually have raspberry jelly on hand. If we did, it might work, but again, we're not talking about a PB & J sandwich, we're talking about a chocolate bar. And I personally can't imagine any other flavor of jelly working with this candy. It's tart like the label says it is. Sonia wishes there were a lot more of the jelly in the mix. I disagree. I think more jelly would have upset the delicate balance. I think with more jelly, TJ's might have run the risk of having it turn into a peanut butter and jelly sandwich with chocolate as the "bread." As it is, it's a nice chocolate and peanut butter dessert with a little novelty and a little uniqueness in the form of raspberry jelly. The raspberry jelly is just the proverbial "icing on the cake," and not much more. But it shouldn't be more. If it were more than that, this would have been a different product entirely. Sonia gives this product 2.5 stars. I give it 4. The discrepancy in our scores is almost entirely due to our feelings about the raspberry jelly. I agree that it was delicious, but sometimes you have to be careful of having "too much of a good thing." I am not a fan of PB and J sandwiches...and so won't be trying this! I'm just nosy, but does your Trader Joe's keep rearranging their goods? Cereal section and nuts....switched, fresh vegetable refridgerator switched with cheeses!!! Like every month! I LOVED LOVED this candy bar! 5 stars from me!!!! In fact you actually "liked" my Instagram of the empty wrapper just the other day. I am a long time blog follower and Facebook friend so it kinda made my day when you liked my Instagram. Keep up the good reviews. I almost exclusively grocery shop at Trader Joes so I always read and try what you think is top notch! They had another PB&J bar before that I think was called the Ugly bar, maybe... I want to say it had potato chips in it too. It also has a firm raspberry jelly in it. Is this a firm jelly, or a softer, jammy consistency? 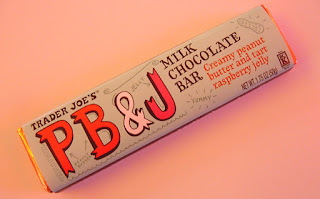 Either way, I will probably try it, as I really miss Russell Stover's PB&J cups! I too instagrammed my empty wrapper! Lol! We bought two of these during our last trip to TJ's and they were both gone by the time we got home. Hubs is a peanut butter addict and devoured it! 5 stars from us. Yes, Martha, most of the TJ's I've shopped at occasionally switch things around just to confuse us. Thanks for the love, Lauren! And yes, some of our shopping ideas come from Instagram accounts like yours, Amanda and Lauren, so keep putting up pics of TJ's stuff on Instagram! Ugly bar, Amie? Weird. Sounds interesting. The jelly in this bar was just a thin layer of "jammy" jam. I saw this last weekend at my TJ's and wondered about it. Might have to try it, although at 280 calories, it'll have to be on a day I run 5 or 6 miles to assuage my guilt. they are peanut butter cups crossed together with pb&j! I love love love them. I put them just one notch below the black sea salt caramel chocolate! If the jelly were thicker itd surpass it! I just ate one of these for the first (and last) time. I LOVE chocolate and I LOVE PB&J, but this was just awful! I'm not sure why, though. I think maybe it was the chocolate that made it so bad, like a cheap no-name chocolate bunny. But I can see I am in the minority here, so enjoy!